Coming Soon! A hearty, sweet blueberry melomel (fruit seasoned mead), a marriage of fruit and flower made from our darker honey of the blueberry blossom, seasoned with a generous dose of Prince George, Virginia blueberries from local blueberry fields, for a fresh -tasting, healthy mead. This one gets a nice hint of oak from being aged for 3 months with Oak chips for an excellent woody blueberry flavor. 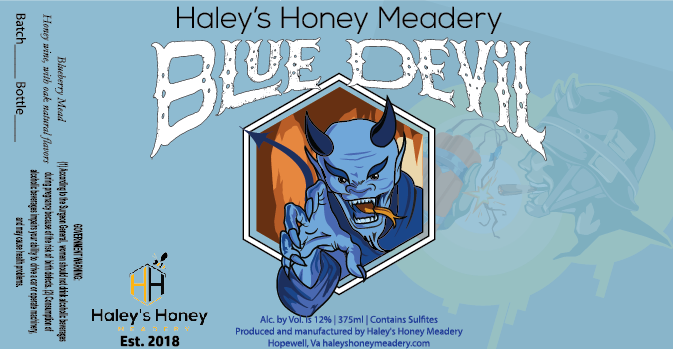 Blueberry Mead pairs with appetizers, fish, cheese, and wild game, or dessert! Mead Master Mike Haley makes mead as the ancients did, unfiltered and with real fruit. Bees make honey the same since the dawn of time. The tradition of giving a nuptial couple a lunar-month’s supply of Mead to ensure a “fruitful” union came to be known as the “Honeymoon”. A slight hint of blueberries and honey blends together smoothly with a subtle acidic taste, and balances honey’s sweet flavor. Our unique, refreshing recipe is sure to please!